LONG-SERVING FORWARD Kylie Leuluai has confirmed he expects this to be his final year as a Leeds Rhinos player. 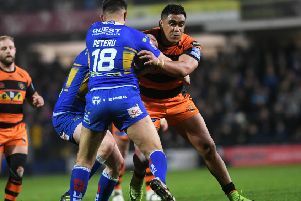 The New Zealand-born former Samoan international turned 37 in March and is on a rolling contract which allows him to play on for as long as he and the club feel he can do a job. He has reversed a decision to retire several times, but said he now intends to hang up his boots at the end of the current campaign. Leuluai, who is close to returning from a three-month lay-off following shoulder surgery, reckons it is now time to start putting his young family first. “I think it will be my final season,” he said. “It is time to move on to a new challenge. “My kids are involved in their own sport and that takes up a lot of time. Leuluai’s son Marley is building his own career as a potential future sports star, though in the round ball code. “He is at Manchester City, so we are down there four times a week,” Leuluai said. “The (Leeds) club pretty much rules your life, they tell you what to do and when to do it, especially at nighttime, with functions and stuff. “Hopefully next year I will be working on different days and I will actually be available for them. Leuluai, who could move into a player-welfare role with Leeds, has made 246 Rhinos appearances, which is a record for a New Zealand-born player. He joined Rhinos in 2007 and is the most successful import in the club’s history, having won five Grand Finals, two World Club Challenges, the league leaders’ shield and – last season – the Challenge Cup. The decision to call time on his playing career has made him more determined to get back on the field. He last featured in the defeat at Warrington on March 13. Initially he was sidelined by a biceps injury, but medics then advised him to undergo an operation on a shoulder. He is now available for selection and said: “I am itching to get out there and play again, especially with this being my last season. “We are down on troops at the moment too, so they need some bodies fit. I haven’t been playing for 11 weeks this week and it has been a long 11 weeks. Rhinos coach Brian McDermott was due to name his initial 19-man squad for Thursday’s visit of Castleford Tigers this afternoon.